These Peanut Butter Oatmeal Cookies are a combination of two classic drop cookies in one: peanut butter cookies and oatmeal cookies. Talk about the perfect lunchbox addition ... for several reasons. First, this easy cookie recipe makes a several dozen cookies per batch. You can also freeze baked cookies or even freeze all or part of the cookie dough to bake later. Plus, the cookies pack well. 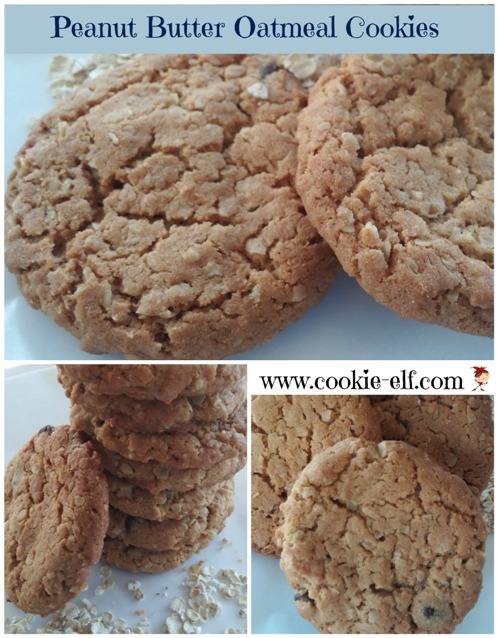 The Elf will even go so far as to point out that Peanut Butter Oatmeal Cookies have “healthier” ingredients compared with other cookie recipes … oatmeal and peanut butter. Preheat oven to 350º F. Line baking sheets with parchment paper or silicone baking mats. Set baking sheets aside. In a separate bowl, with an electric mixer on medium speed, cream together butter, peanut butter, and sugars until light and fluffy, about 3-4 minutes. Add eggs one at time, beating one minute until mixture is smooth. Mix in vanilla extract. Gradually stir flour mixture into creamed mixture until well blended. Mix in oats a little at a time until well incorporated into the dough. Add raisins or chocolate chips (optional) combining them into the thick cookie dough with a large spoon. Scoop cookie dough into walnut-sized balls. Place on baking sheets 2 inches apart. Use the heel of your hand to lightly flatten each cookie. Bake for 11-15 minutes until cookies are lightly brown and firm around the edges. Remove cookie sheets from the oven. Allow cookies to sit for 5 minutes before using a spatula to transfer them to a wire rack. Cool completely. When forming cookies, you can roll cookie dough into walnut-sized balls rather than dropping dough in mounds in order to give cookies a more uniform size. Flatten each rolled cookie slightly with the heel of your hand. Get more cookie inspiration on our Peanut Butter Cookies Pinterest Board. Coconut Macadamia Nut Cookies: a rich, tropical drop cookie ..